A new seminar for graduate students at Columbia University, Teachers College, and The New School. In addition to lectures and readings, course assignments include creating a manifesto and ‘recipe’ that re-envisions how we teach, learn, and make. 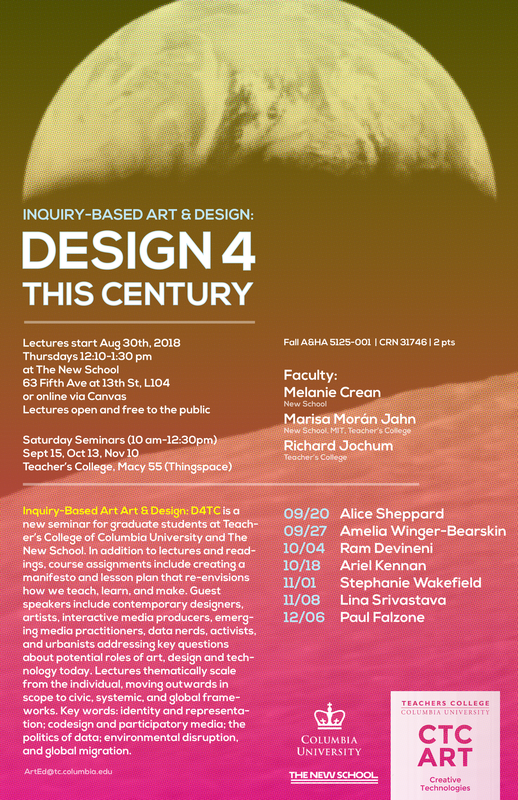 Guest speakers include contemporary designers, artists, interactive media producers, emerging media practitioners, data nerds, activists, and urbanists addressing key questions about potential roles of art, design and technology today. Keywords: identity and representation; codesign and participatory media; the politics of data; environmental disruption; and global migration.